This April C F McEwan will be showing and selling her art, scarves and more from Craft Central's Corner Shop at 21 Clerkenwell Green, EC1. 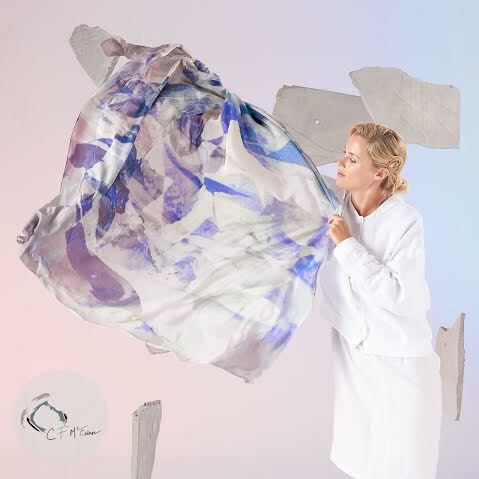 Running from Monday 25th and ending on Sunday 1st May, go along to meet Clare and find out about how she works, plus buy items like her 100% silk scarves, which range from £55 to £170. "Exclusively showcasing C F McEwan products and artworks from Monday 25th April to Sunday 1st May at Craft Central’s Corner Shop. Meet Clare and find out more about her process to create distinctive and timeless imagery across her collections. Highlighted through the week will be the Spring Summer Concrete collection. Explore the hand made concrete tiles and view the original printed artworks inspired by the concrete material."